As a boy I was fascinated by the sheep grazing in tall grass depicted in a reproduction of Elioth Gruner's Murrumbidgee Ranges, Canberra (1937) hanging in our lounge room. My inexperienced eyes did not discern sheep but rather I saw their forms as a scattering of anthills. Fortunately my mother pointed out that the anthills were in fact sheep and proposed that Gruner was not good at painting sheep legs and had avoided the problem by hiding their legs in the grass. At this moment I awakened to the idea that sheep legs must be difficult to depict. Although the notion that Gruner couldn’t paint sheep legs is a fiction, there are many issues about drawing that can be addressed by looking at sheep legs. 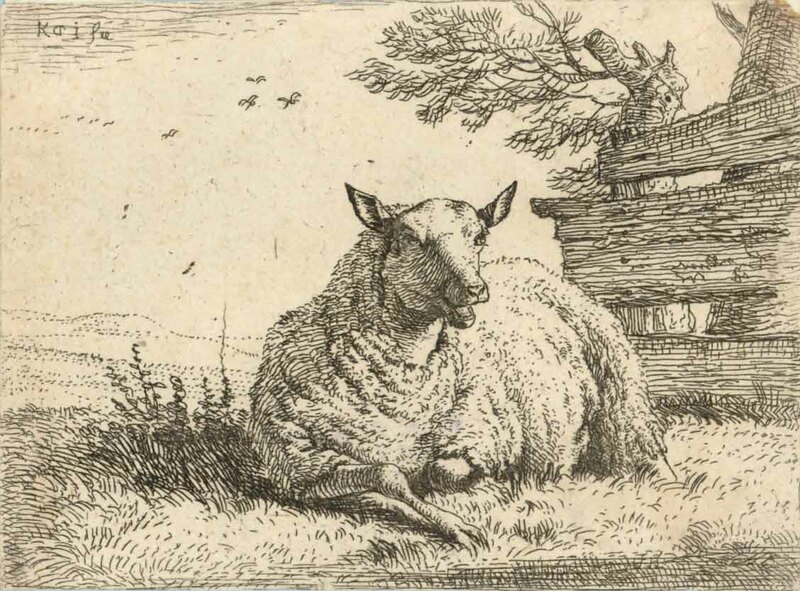 Karel Dujardin (1622–78) can draw sheep legs and he does this very well as can be seen in his small etching, Recumbent Sheep by a Fence. Condition: Good impression on laid paper, trimmed at plate mark with mounting hinges and a collector’s stamp and signature on the back. I am selling this print for $70 AUD including postage and handling to anywhere in the world. Please contact me using the email link at the top of the page if you are interested or click the "Buy Now" button. An essential principle that Dujardin employs in drawing the sheep’s foreleg is to use only straight or convex (i.e. bulging out) lines (see detail below). The idea behind this principle is that a leg is formed from bone, muscle and tendon. Consequently, there are no hollows to be drawn with concave lines. In rendering the light and shade on the leg, Dujardin is careful to add reflected light on the shadow side of the leg (see detail below). This depiction of light bouncing up from the ground was probably not evident when Dujardin was observing the sheep in its real setting but it is needed as a graphic aid to portraying the structure of the leg. One principle that Dujardin could employ more effectively is how to project the notion of weight in a sheep’s leg. Usually artists add an accent of tone at the points of the silhouette edge where the weight of the leg makes contact with the ground. Going further, the procedure is also to merge the subject with the ground between these accent points. Dujardin has merged the hoof of the sheep with the ground but the accents are not clearly shown. More critical to the drawing of the leg is the indecision about how the leg's upper part rests on the ground. From my standpoint the lack of accents linking this region to the ground makes it levitate. In the detail below I have marked the possible contact points where dark accents could have been left.